WHEN I THINK OF THE WOMBATS, I BYPASS THE NOCTURNAL, SHORT-LEGGED VOMBATIDAE, AND TRY TO FIND MYSELF A STURDY COMB TO GIVE IN TO THE URGE TO OBSESSIVELY BACKCOMB MY HAIR. IT MIGHT BECOME A DAY’S JOB AND THE RESULT WON’T FALL WITHIN ANY STYLE CATEGORY, BUT IT’LL STAY UP ON THE DANCE FLOOR WHILE I JUMP TO THE LESS THEN HAPPY LYRICS OF SINGER MATTHEW “MURPH” MURPHY. 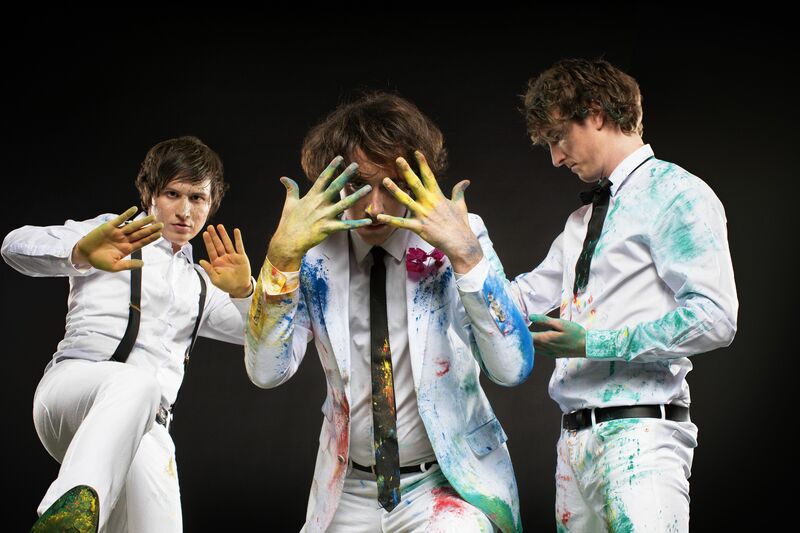 POSTPUNK/ INDIE ROCK BAND THE WOMBATS (MATTHEW MURPHY, TORD OVERLAND-KNUDSEN AND DAN HAGGIS) JUST RELEASED THEIR SIXTH SINGLE “1996” (SEPTEMBER2011) FROM THEIR SECOND STUDIO ALBUM, PRODUCT OF INSPIRED REBELLION “THIS MODERN GLITCH” , DARKER SUCCESSOR TO THE WOMBATS EP (US ONLY) AND THEIR DEBUT ALBUM “A GUIDE TO LOVE, LOSS & DESPERATION” (2007). WHEN PLANS WERE ALTERED FROM A FACE-TO-FACE INTERVIEW TO A PHONE-INTERVIEW (NOT DUE TO THE WOMBATS, MIGHT I ADD) PERSPECTIVES CHANGED. THE CURSE OF THE PHONE INTERVIEW MEANS THAT YOU ARE FAMILIAR WITH THE INTERVIEWEE, BUT HE OR SHE CAN ONLY JUDGE BY VOICE. THAT MEANS THAT GLANCES OF SARCASM GET LOST IN TRANSLATION. BECAUSE DRUMMER DAN HAGGIS OFTEN LEANS TOWARDS LESS THAN A SERIOUS APPROACH – THINK VARIOUS WIGS- WE DECIDED TO START OFF THE INTERVIEW A LITTLE LIGHTER THAN USUAL. BUT THE CURSE OF THE PHONE INTERVIEW STRIKES AGAIN AND ‘DAN-THE-MAN’ TURNS SERIOUS FROM THE BEGINNING, CONTEMPLATING THE POSSIBLE EXTINCTION OF HAGGIS. A CONVERSATION ABOUT INSPIRATION, TOURING, REALITY AND ESCAPISM. Sanderz: “Global Warming’s a threat to haggis” was what I found when googling climate change + Dan Haggis. Now haggis is a hard thing to explain, I guess if you live outside the UK. What are your feelings about this meat dish becoming extinct? Dan: It’s a black pudding. In some respect if animals gonna be killed, it’s useful to use every single part of it. Anyway, it’s a nice dish, but to be honest it’s not something I eat very regularly. Tradition wise it’s always a shame when something dies out, unless that tradition is a bad tradition. The extinction of this tradition isn’t not gonna affect me too much, to be honest. Sanderz: “Tokyo” (Vampires and wolves) is a song from your new album “This Modern Glitch” about escapism. How great is the urge to run when dealing with the facts of Climate Change or the doom and gloom on what’s predicted for the future? Dan: I’m a member of the Green Party, but from the age of 18 till 23 or 24 I was very obsessed with the human impact on the environment. I’m still concerned about that. Back then it already felt so bad walking around city centers and seeing the amount of local pollution produced by cars. It was disheartening. Yeah, I think escapism from that and all sorts of things in life is an important part. It’s the Ostrich Syndrome: you just bury your head in the sand, which is what a lot of people do. 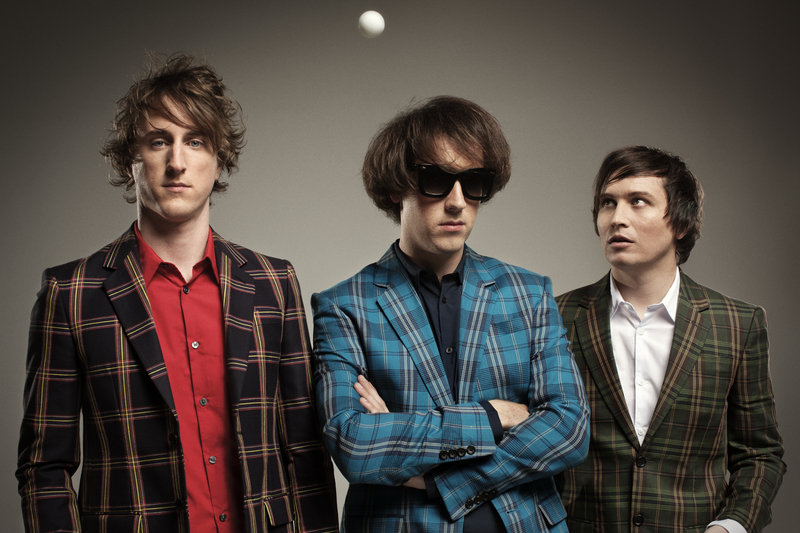 I think a lot of the lyrics of the Wombats are very escapism- based, whether it’s going to another time or a place. To be honest, I only revert to alcohol. That’s one of my guilty pleasures. Apart from that, I’m making small changes in my own life and trying to tell other people around me to do the same. It’s really hard being in a band and live by the rules that you think you should live by. As being a member of the Green Party I didn’t do enough. I didn’t go on marches and so on, because we were always on gigs, travelling places to do shows. At that time I wrote a lot of songs with the environment in mind. I was so frustrated that the media wasn’t talking about it enough, were as now everyone is talking about it all the time. It’s a very current affair and in the mind of governments. Sanderz: For the sophomore album life experiences are basically limited to touring, promoting “the debut album”. How did you creatively fill this void to come to “This Modern Glitch”? Dan: It took us a year-and-a-half of writing to get “This Modern Glitch” finished, because we’d been touring so much. During the tour, we hadn’t really been writing songs, so it took a little bit of time. Musically it was like being in a desert and all of a sudden we arrived at this oasis. Metphorically speaking: we couldn’t drink too much at once, just a little bit at a time. After a while we got better and better in writing songs. For that reason, the majority of this album was written in the last half year before we started recording in the studio. Sanderz: How was it to stop touring and suddenly be home? Dan: Touring is like a drug and when it stops, you really miss the adrenaline rush each night. You don’t have the same sense of direction as you do when you are on tour, but I think we definitely needed a break. We were all very tired and we just needed some time away from each other, sit down on a couch, and not be on a bus or waiting at an airport. Sanderz: Although “This Modern Glitch” is darker, more synth-based album. It’s an incredible, accessible and upbeat record, and for those who’ve been living on this planet a few decennia more than the Wombats have themselves, it’s like reliving their youth somehow. 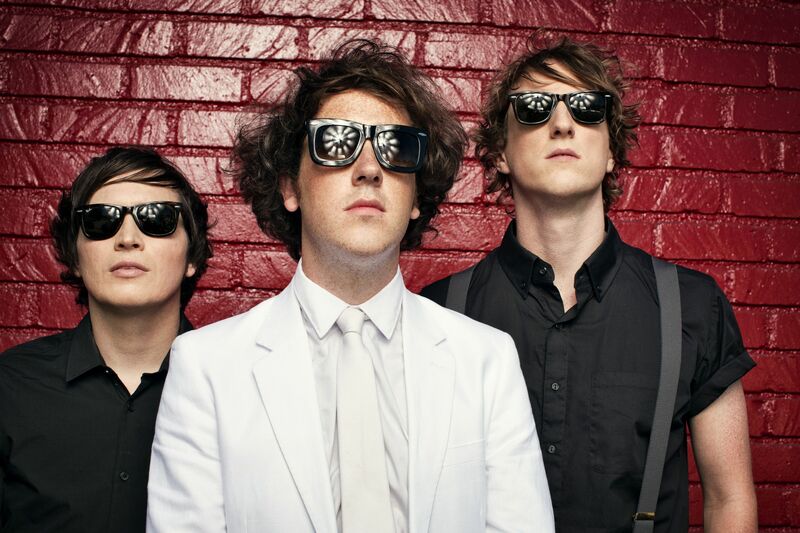 How important are Murph’s (Matthew “Murph”Murphy) ironic, personal & introspective lyrics for the success of the Wombats? Dan:I think the lyrics are an important aspect of writing music. Murph has a very unique style of writing, it sets us apart from other bands. His lyrics are very introspective and personal, because he writes from the heart and from experiences. Sometimes it’s even hard for him to sing some of the songs like ‘Anti-D’ and ‘Schumacher the Champagne’. Those are songs about insecurity, but in an ironic way, with a humorous twist. Obviously we’re trying to make the music as quirky and upbeat as possible to give it this nice dichotomy, as happy-sad,…..
Sanderz: Besides being a Wombat, you’re also involved in other projects like Sin and Too Many JD’s with Tord (Knudsen-Overland). Can you elaborate on your choice of exploring other musical directions? Dan: We actually changed the name of ‘Too Many JD’s’. Now it’s ‘The Captain and The Princess’. All three of us like so many types of music and each of us can create different sounds, different types of music. Then, when we want to do something with that, it’s not always suitable for the Wombats. So Tord and I sometimes write some songs, finish them in our own way and that ends up being ‘Too Many JD’s/ the Captain and The Princess’. Tord’s ‘SiN’ project was with his friend (Marius Drogsas) from back home. He’s been making music with him for years. I think it’s really important to keep making different kinds of music. Recording and writing wise it gives us more experience and makes us stronger as a band. It’s a positive thing. Dan: My favorite mode of transport. It’s one of the most environmentally friendly ways to travel, and the UK has one of the best train systems. You can get anywhere basically. I feel most relaxed in the train and you get to watch the world passing by. It’s lovely. Dan: We’re so self-obsessed with the touring and the album. The most positive thing is probably our album coming out. Dan: Good friends. Three very good friends. Not having to do anything but music, making people smile every night. ……Sanderz: Is that an important part of why you’re making music? Dan: Oh yeah, I think it is. It’s therapy for us. It’s just seeing people’s reaction every night. Apparently last night there was a pregnant woman and her baby kicked for the first time during ‘Anti-D’. That was a pretty cool thing. Dan: It’s less important now, but my cousins like bobbing for apples. Sanderz: The name of the band was chosen not long before your first gig. What’s your relation with these marsupials? Dan: We’ve met quite a few Wombats. We’ve been in Australia a few times. They’re quite strange creatures, quite cuddly. I recommend them to anyone. But they can’t see very well. So they try to eat everything on their path. We’re pretty much the same, but we try not to be. Sanderz: When touring this extensively with the Wombats are you taking any measurements to reduce your carbon emissions? Dan: The biggest carbon emissions from bands are not made by airplanes or buses. It’s mosty caused by fan travel. The problem starts, when you have two or three thousand people driving to a show. It’s obviously very hard touring as much as we do. We travel with about ten people around the world to do gigs. We’re doing a tour at the moment that should be in two buses and two trucks, but we’re touring with only one bus and one truck. It’s not the most comfortable, but it’s economical and best for the environment. Apart from that: turn the tap off when you’re shaving and do not shower too long. Those are things we try to do all the time. When it comes to travelling, there’s not a lot we can do. We take a train when we can. We hope that the technology and the government will make changes on a large scale that will benefit everyone. Sanderz: Talking weather, not climate. We started this October with falling leaves and bikinis. Your comment? Dan: It’s strange isn’t it. The last week in the UK has been insane. The hottest temperature in October in history. I think this change has been happening for a while, hasn’t it. I have a girlfriend in Norway. I was speaking to her grandparents: there used to be snow all winter and it’s gotten less over the years. Everyone you speak has noticed that definitely things are changing. I think the media, politicians and people in general are very aware of that. So hopefully things are going in the right direction. We try and get passed one hurdle and another one springs up. We keep our fingers crossed. Sanderz: The obvious question we ask all interviewees: What do you do in your daily life to reduce your carbon footprint? Dan: I got my electricity from a company called Ecotricity (www.ecotricity.co.uk), which is solely wind power. I have to pay a little bit more but it’s worth it. I don’t use a car very often. I live in town, so I walk and cycle everywhere. Or I take the train. Apart from that, I recycle and I write letters to the council when they don’t recycle. Just doing everything I can really.